In the last month, for the first time since the civil war in Syria began in 2011, the United States has directly attacked Syrian government forces or proxies — not just once, but at least four times. The urgent question now is less about Syria than Russia, which in response to the latest of these incidents, in which a U.S. fighter plane shot down a Syrian jet, threatened to target any U.S.-led coalition aircraft flying over Syria. Are the U.S. and Russia being sucked into war in the Middle East, and if so, how can escalation be averted? The present political dynamics in the Middle East are unsettled and kaleidoscopic. But in the interests of brevity, leaving aside smaller players, and before we think about the role of the United States and Russia, the basic configurations of power in the region since the 2011 Arab Spring can be simplified in terms of five loose groupings. As its title suggests, this brief highlights the number of conflicts and battlefield deaths that have occurred in the world since 1946. The text´s authors note, for example, that 1) the number of armed struggles in the world declined slightly from 52 in 2015 to 49 in 2016; 2) 14 percent fewer people died in 2016 as a direct result of violent conflicts than in 2015, and 22% fewer than in 2014; and 3) the internationalization of organized violence continues apace, which consequently makes such clashes longer lasting and more difficult to solve. 2016 was the fifth most violent year in the world since the end of the Cold War. While violence levels were lower than in 2014 and 2015, ongoing conflicts with serious regional impacts are challenging the international community’s ability to ensure global peace. There was a decline in battle casualties in 2016. 14% fewer people died in 2016 as a direct result of conflict than in 2015, and 22% fewer than in 2014. The number of armed conflicts in the world declined slightly from 52 in 2015 to 49 in 2016. The internationalized conflicts in Syria, Iraq, and Afghanistan have the highest number of casualty levels globally. The trend in the increasing internationalization of conflicts is concerning, as these conflicts, on average, last longer, are more violent, and are more difficult to solve. Last week there was a fire in a high-rise building in London that killed dozens. British Prime Minister Theresa May was slow to issue a statement, and it was another day before she visited the scene – and then only to meet with members of the emergency services. It was not until day three that she paid a visit to the survivors. Her explanation was that she was busy overseeing the management of the disaster and therefore couldn’t go sooner. She was met by a storm of criticism. Two questions arise from this affair. First, why would anyone think an empty gesture like visiting the site of a fire – no matter how many died – to be important? Perhaps the prime minister ought to be doing something productive? Second, why did May answer that she was busy overseeing the crisis? Exactly what was it about the disaster that she could oversee? She faced what seemed to be unreasonable condemnation and replied with a preposterous justification. But it is the first question that I want to discuss because it raises another, more important question: that of leadership. The simple answer to the first question is that May ought to have visited the site of the fire because that’s what prime ministers do. They engage in gestures, and whatever they may privately feel or not feel, they show themselves to be grieving the dead. A prime minister, a president, a king or a queen represents the country at moments such as these, and their responsibility is to convey to the country the gravity of the event, the sorrow they feel, and that the state – personified by them – is not indifferent to the suffering of its citizens. There is little argument that the relationship between the public and private sectors has to be far stronger in order for the U.S. Government and U.S. Businesses to adequately protect themselves from emerging cyber attacks. One of the challenges to date has been agreeing on how to share information between the two sectors, with complaints from the private sector that the Government is great on taking information, not so great with sharing it back. Oftentimes, say experts, the restrictions on sharing have to do with a classification process that is slow to adapt to the times we live in. Lawmakers have debated the issue for years, making incremental progress while the adversaries gain the upper hand. The Cipher Brief’s CEO and Publisher Suzanne Kelly talked with Cipher Brief Expert and former deputy director of the NSA, Chris Inglis about where the weaknesses in cooperation lie and what needs to be done to better secure both the Government and private sector from what’s coming. Suzanne Kelly: Do we need a new model for how intelligence agencies interact with the private sector? Chris Inglis: There is a need for transformation of how we think of this space –methods and protocols we bring to bear and how we think of each other for purposes of cross-sector collaboration. That is going to be born on the back of real work, not just big ideas. We are going to actually have to do some practical things that allow us to build trust as a basis for needed collaboration as we go forward. The Persian Gulf region was shaken by a massive political earthquake on June 5, 2017 when four Arab countries – Saudi Arabia, United Arab Emirates (UAE), Bahrain and Egypt – announced that they were severing all political, economic and diplomatic links with Qatar, a member of the Gulf Cooperation Council (GCC). The four countries were soon joined by Libya, Yemen and even Maldives. However, Kuwait and Oman, the remaining two members of the GCC, refused to follow the lead of Saudi Arabia in this regard. Saudi Arabia said that it took the decision because of Qatar’s “embrace of various terrorist and sectarian groups aimed at destabilising the region”, including the Muslim Brotherhood, al-Qaeda, the Islamic State of Iraq and Syria (ISIS) and groups supported by Iran. Qatar vehemently denied that it supports terrorism, arguing that it has assisted the United States in the War on Terror and in the ongoing military intervention against ISIS. While the immediate causes of the drastic action are not clear, problems between Saudi Arabia and Qatar have been brewing for some time. Tensions between Qatar and its Arab neighbours have grown in recent years as part of a tussle for regional leadership. Qatar, buoyed by its huge earnings from the production and export of gas, has been trying to carve out a comparatively independent foreign policy that is at variance with the approach of Saudi Arabia and other major Arab nations. Qatar's influential television channel Al Jazeera, which is extensively viewed in the region, often adopts positions that are critical of Saudi Arabia. In April 2017, Qatar was involved in a deal with militants in Iraq and Syria to secure the return of 26 Qatari hostages, including royals. What apparently outraged Saudi Arabia and UAE was the large amount of about USD one billion paid by Qatar to secure the deal. Subsequently, on May 27, Qatar’s Emir called up Iranian president Hasan Rouhani to congratulate him on his re-election. The call was seen as a clear, public, defiance of Saudi Arabia’s efforts to create a united front against Iran, which latter it perceives as an implacable foe. The May 31 deadly terror attack in the heart of Kabul that killed and wounded hundreds of ordinary Afghans was not the first one in such a highly important area, nor was it the first time that the Afghan National Defense and Security Forces (ANDSF) have failed to safeguard their own perimeters – not to mention their repeated failures to protect key civilian institutions, peaceful gatherings, and diplomatic missions in the country over the years. A month before the deadly Kabul attack, a Taliban suicide squad stormed the Afghan National Army’s (ANA) main base in the north of the country, leaving carnage behind – 150 Afghan soldiers were killed and another 100-plus were injured. Over the past several months, militants were able to breach security parameters and hit key ANDSF institutions deep inside the Afghan capital, Kabul. Among the targets were the largest Afghan Military Hospital, cadets of the Afghan National Police (ANP), the Afghan Ministry of Defense, and the Directorate of VIP Protection and Security – an elite agency responsible for protecting high-ranking Afghan government officials and prominent leaders. Although Pakistani “safe haven and support” for the insurgent groups along with insurgents’ resilience and adaptability are notable factors in carrying out such deadly assaults, the main reasons why ANDSF consistently fails to foil high-profile attacks are inattention to Afghanistan’s main intelligence agency, known as the National Directorate of Security (NDS), and political interference and appointments in ANDSF institutions.Enjoying this article? Click here to subscribe for full access. Just $5 a month. The U.S. continues to face a daunting challenge in Afghanistan, as it aims to bring stability to a country that has been plagued by conflict for decades. The Cipher Brief’s Bennett Seftel sat down with Anthony Cordesman, Arleigh A. Burke Chair in Strategy at the Center for Strategic and International Studies, to discuss why the United States’ strategy in Afghanistan has failed to deliver a desirable outcome and how the Trump Administration should approach the longest war in U.S. history. The Cipher Brief: It’s been reported that the Taliban controls approximately 30 percent of Afghanistan, the most territory it has controlled since 2001. What more can be done to beat back Taliban advances and stabilize the country? Anthony Cordesman: First, we need to be very careful about the numbers involved. There are indications that the Taliban increased the number of districts where it has a very substantial presence by about ten percent last year. The difficulty is, what does that actually mean, because if you are trying to minimize Taliban control, you can get districts being reported as under government control when all the government really controls is the capital of that district and sometimes only a few buildings within it. This is an insurgency. We are talking about an ongoing struggle for hearts and minds, and we are talking about different rebel factions. The fact that the government in Kabul may have an interest doesn’t mean that it’s really the government in control – often it’s a power broker. We really are watching what is an expansion of threat influence. But none of these statistics are particularly reliable. In the past, there has been a tendency to exaggerate government control and to give the government credit if it has some kind of presence in a district capital, even if that presence wasn’t really doing anything and was grossly corrupt. President Donald Trump’s administration appears ready to harden its approach toward Pakistan to crack down on Pakistan-based militants launching attacks in neighbouring Afghanistan, U.S. officials tell Reuters. Potential Trump administration responses being discussed include expanding U.S. drone strikes, redirecting or withholding some aid to Pakistan and perhaps eventually downgrading Pakistan’s status as a major non-NATO ally, the officials said, speaking on condition of anonymity. Some U.S. officials, however, are sceptical of the prospects for success, arguing that years of previous U.S. efforts to curb Pakistan’s support for militant groups have failed, and that already strengthening U.S. ties to India, Pakistan’s arch-enemy, undermine chances of a breakthrough with Islamabad. U.S. officials say they seek greater cooperation with Pakistan, not a rupture in ties, once the administration finishes a regional review of the strategy guiding the 16-year-old war in Afghanistan. Precise actions have yet to be decided. The White House and Pentagon declined to comment on the review before its completion. Pakistan’s embassy in Washington did not immediately respond to a request for comment. MELBOURNE, Australia — China has deployed its newest anti-submarine aircraft and stepped up unmanned aircraft deployments to Hainan island on the fringes of the South China Sea, according to satellite imagery obtained by Defense News. Satellite photos taken on May 10 and May 20 by commercial satellite imagery company DigitalGlobe showed four Shaanxi Y-8Q turboprop aircraft with its distinctive magnetic anomaly detector boom parked on the ground at Lingshui Air Base in the southeastern part of China’s Hainan island. The satellite pass from May 10 also showed three Harbin BZK-005 high-altitude, long-range UAVs at the base. This is the largest number of BZK-005s to have been seen at Lingshui since they were first noted in 2016. The drones have also previously been observed at the Chinese air base at nearby Woody Island, in the disputed Paracel Islands. In addition, two KJ-500 airborne early warning aircraft were also seen at Lingshui on both occasions. Defense News had previously reported on the deployment of the KJ-500 to Hainan at nearby Jialaishi Air Base that had been seen on satellite photos taken in March, which was the first time the KJ-500 had been seen deployed by the People’s Liberation Army Navy, or PLAN. This is the first time the Y-8Q has been seen at Hainan, with China having previously rotationally deployed maritime patrol aircraft detachments to Lingshui, made up of a mixture of older Y-8Js and Y-8Xs drawn from the PLAN’s two special-mission aircraft regiments based in northern China. Lingshui is one of three PLAN air bases in Hainan, which is the southernmost province of China and borders the northern edge of the South China Sea. The three bases are normally home to three regiments of Shenyang J-11B Flanker fighters and a single regiment of Xian JH-7 fighter-bombers, from which they have been used on occasion to intercept routine U.S. military flights operating in nearby international airspace. The base’s previous claim to fame was being the air base on which a badly damaged U.S. Navy EP-3 Aries surveillance aircraft force-landed following a midair collision with a Chinese Shenyang J-8 interceptor during an aerial encounter in 2001. The Y-8Q is the newest maritime patrol aircraft to be fielded by China and the first combat-capable PLAN aircraft of this type, boasting of improved anti-submarine warfare capabilities that the older Y-8J and Y-8X lacked. It is based on an improved Shaanxi Y-8 airlifter airframe with improved turboprop engines and high-efficiency, six-bladed propellers. In addition to the magnetic anomaly detector boom, which is used to hunt submarines by detecting minute variations in the Earth’s magnetic field, the Y-8Q also has a surface-search radar and an electro-optical turret for the maritime patrol mission, while a fuselage weapons bay located forward of the main landing gear will likely be used for carrying torpedoes. After months of speculation and palace intrigue, Saudi King Salman shook up the kingdom's line of succession on June 21 by naming his powerful son, Mohammed bin Salman, crown prince and removing all titles from Mohammed bin Nayef, the former crown prince. This is the second time Salman has overhauled the line of successionand the Saudi government since taking the throne in January 2015. The move is a controversial one, considering it cuts large and powerful segments of the royal family out of the succession plan. And should the young bin Salman ascend the throne, it could mean Saudi Arabia will be ruled for six decades by father and son. Today's announcement has several important implications. But none is as important as the amount of trust being placed in bin Salman, who has already amassed enough power to be dubbed "Mr. Everything" by some Western governments. As bin Salman has concentrated his power, bin Nayef has been increasingly sidelined. Today's reshuffle will only remove him from power even further, ousting him from his position at the head of the Interior Ministry and from all other leadership roles. If bin Salman becomes king, he will be the youngest Saudi ruler in modern history, able to potentially preside over decades of policy and reform in the kingdom. The crown prince is known for spearheading the country's economic reform, an agenda he will likely continue to push, and he may well turn his attention to effecting social change as well. Why has Italy been spared mass terror attacks in recent years? Each time Youssef Zaghba landed in Bologna, there was someone waiting for him as he got off the plane. It was no secret in Italy that the 22-year-old Moroccan-born Italian, identified as one of three terrorists behind the London Bridge attack, was under close surveillance. In the weeks since the attack, Zaghba’s role has shone a light on the differences between how terror suspects are handled in Italy and the UK. Upon his arrival in London, Zaghba’s mother said, he was never once stopped at the airport or interrogated, even though Italian officials had warned British counterparts that he was a threat. Franco Gabrielli, Italy’s chief of police, has said of Italy’s efforts to alert the UK: “Our conscience is clear.” Scotland Yard, in turn, has said Zaghba “was not a police or MI5 subject of interest”. Italy has suffered from its share of political violence in recent decades, including the murder of two prominent anti-mafia judges in the 1990s. But unlike almost all of its big European neighbours, it has not witnessed a major terrorist attack since the 1980s. Is Italy just lucky? Have the country’s counter-terrorism policies – born out of years of anti-mafia policing and intelligence work and a decade of bloody political violence in the 1970s – given Italian officials an edge in the age of Isis? Or are there other factors at play? “The main difference is Italy doesn’t have a big population of second-generation immigrants that have been radicalised or could potentially be radicalised,” said Francesca Galli, an assistant professor at Maastricht University and an expert in counter-terrorism policies. The photograph was released following a low-profile visit by Russian Minister of Defence Sergei Shoigu to the ISS Reshtnev satellite factory near Krasnoyarsk. It is possible the photograph was released as part of an intentional leak — Russia has used this tactic in the past. However, the absence of the photograph from the Russian MoD website suggests that the leak may have been unintentional. On June 6, a delegation headed by Russian Minister of Defence (MoD) Sergei Shoigu visited the ISS Reshetnev satellite factory near Krasnoyarsk. Intended to acquaint Russia’s leadership with the company’s military products, it was a relatively low-key visit that was not even mentioned on the company’s website. Several photographs of the visit taken by a TASS photographer were released by the Russian MoD and subsequently appeared on the Press Association and Getty websites. One of the photographs showed the delegation inspecting a board containing information on a geostationary satellite identified as the ‘Repei-S’ and what appears to be a sister satellite named ‘Repei-V’ that will fly in highly elliptical orbits. Significantly, the name Repei (meaning ‘burdock’) had not previously been associated with any Russian satellite project known in open sources. What are the Repei satellites? In the wake of recent terror attacks, people have questioned the role of tech companies in fighting terrorism online. We want to answer those questions head on. We agree with those who say that social media should not be a place where terrorists have a voice. We want to be very clear how seriously we take this — keeping our community safe on Facebook is critical to our mission. In this post, we’ll walk through some of our behind-the-scenes work, including how we use artificial intelligence to keep terrorist content off Facebook, something we have not talked about publicly before. We will also discuss the people who work on counterterrorism, some of whom have spent their entire careers combating terrorism, and the ways we collaborate with partners outside our company. Our stance is simple: There’s no place on Facebook for terrorism. We remove terrorists and posts that support terrorism whenever we become aware of them. When we receive reports of potential terrorism posts, we review those reports urgently and with scrutiny. And in the rare cases when we uncover evidence of imminent harm, we promptly inform authorities. Although academic research finds that the radicalization of members of groups like ISIS and Al Qaeda primarily occurs offline, we know that the internet does play a role — and we don’t want Facebook to be used for any terrorist activity whatsoever. We believe technology, and Facebook, can be part of the solution. We’ve been cautious, in part because we don’t want to suggest there is any easy technical fix. It is an enormous challenge to keep people safe on a platform used by nearly 2 billion every month, posting and commenting in more than 80 languages in every corner of the globe. And there is much more for us to do. But we do want to share what we are working on and hear your feedback so we can do better. According to Islamic terrorist training manuals, interrogations of captives and monitoring of Internet messages over a decade of efforts to evade the growing use of aerial surveillance has not yielded any satisfactory solutions. Persistent surveillance, improved sensors and analysis software able to aid in monitoring and interpreting aerial video no matter what countermeasures were used. This presented Islamic terrorist groups everywhere with more challenges than they could cope with. Recently captured ISIL (Islamic State in Iraq and the Levant) training manuals showed that the only solutions that worked to any degree severely limited Islamic terrorist mobility and combat options. Examination of recently captured Mosul neighborhoods prepared for concealment found that in practice the only thing that worked to any extent was tunnels and carefully constructed above-ground concealment from observation. This last technique, using tent cloth, blankets and sheets to cover alleys and portions of open terrain worked for a short time until (unknown to the Islamic terrorists) the use of statistical analysis revealed much of what the Islamic terrorists thought was hidden. The “blankets and sheets” approach in now only used as a last resort. By 2014 Islamic terrorists training manuals recommended carefully built tunnels and breaking down interior walls of buildings or basements to provide effective surveillance from the enemy. The main problem for the Islamic terrorists was the rapid increase in manned aircraft, UAVs and stationary vidcams in towers and balloons that provided more eyes more frequently than could be avoided. Not only that but the Americans and Israelis developed communications systems like Rover (Remote Operations Video Enhanced Receiver) that enabled troops on the groups to see real time video. Who is the next leader of the free world, now that the US is not? Donald Trump’s decision last week to remove the US from the Paris Agreement on climate sent a crystal-clear signal that we’re now living in a G-zero world, a world without consistent leadership. Who is leader of the free world today? Not Trump, the first US president since the 1930s who does not believe that international leadership is in the US national interest. For Trump, everything is a transaction. He sees the world not as a community—sometimes cooperative, sometimes contentious—but as an arena in which strong leaders fight for dominance. This view appeals to Trump personally, and he knows his loyal supporters like it too. Are Europeans now leading the free world? Not exactly. The transatlantic alliance has been gradually hollowing out for many years, and the election of Trump has veteran leaders like Germany’s Angela Merkel and new ones like France’s Emmanuel Macron scrambling for new strategies. The Americans are sceptical of NATO, the British are leaving the European Union, and anti-EU political parties continue to make gains, even if they aren’t yet winning elections. Merkel and Macron don’t appear to agree on Europe’s best course forward, and if Europe’s leaders fail to meet the demands of their people for change, the populist forces that have transformed European politics in recent years will continue to rise. CAPITOL HILL: The nation does not need a new armed service specializing in space, the leaders of the Air Force said today in rejecting a House Armed Services Committee plan. In fact, they said, carving a “Space Corps” out of the Air Force — which handles most space missions today — would only make it harder to integrate space operations with warfare in the air, cyberspace, land, and sea. The brainchild of Strategic Forces Subcommittee chairman Mike Rogers, the HASC proposal would create the Space Corps as its own service with its own Chief of Staff sitting on the Joint Chiefs. The new Space Corps would be a separate uniformed service from the Air Force but would report to the civilian Air Force Secretary, who would oversee both Air Force and Space Corps acquisition. That’s similar to the longstanding arrangement whereby the Marine Corps is a separate service from the Navy but reports to the Navy Secretary. The Navy-Marine model proves such arrangements can work — but then the sea services have had since 1798 to work out the many bugs. Earlier this month, Canada released a white paper that set outs the country's defense policy for the next twenty years. The headlines have focused on the massive spending increase, mostly to placate President Trump, who has criticized NATO countries for not pulling their own weight. The government intends on increasing the Canadian Forces' budget by 70 percent--mostly to buy big ticket items like eighty-eight fighter aircraft to replace its aging CF-18 (a variant of the U.S. F/A-18 Hornet) and six arctic patrol ships, and to grow the regular force by 3,500 to a total of 71,500, and to add 1,500 to the reserves. Beyond the new toys and quintessentially Canadian hand wringing about the role the military should play in peacekeeping missions, the white paper signals a shift in Canada's approach to cyberspace. For the first time, the government has acknowledged that the Canadian Forces will build an offensive cyber capability deployable in support of government-authorized military missions. Canada has had the ability to engage in offensive cyber operations for a while now, depending on how you define them. The country's signals intelligence agency, Communications Security Establishment (CSE), breaks into foreign networks to extract foreign intelligence all the time, much like its other Five Eyes partners. It also supports the Canadian Forces with intelligence support when on deployment, as it did when Canadian troops were deployed to Afghanistan and in contributions to combating the self-declared Islamic State. The Indian Navy’s Boeing P-8I long-range maritime patrol aircraft, reputedly the world’s most fearsome submarine hunters, have proved themselves in joint patrols with the US Navy in the Indian Ocean, tracking Chinese submarines. Last July, a pleased Indian Navy signed a billion-dollar contract with Boeing for four more P-8Is to augment the eight aircraft it already flies. Delivery will begin in 2020. But, with Chinese submarine activity growing in the Indian Ocean, the navy wants more P-8Is on station today. 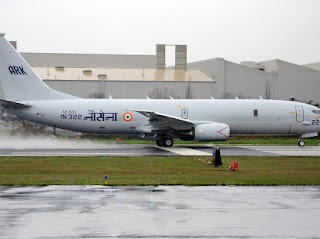 Last Monday, the navy signed a $100 million contract; requiring Boeing to maintain spare parts and personnel in India, ready to respond to any defects or failures in the P-8I fleet over the next three years. The so-called “performance based logistics” contract requires Boeing to continue the warranty services it has so far provided under an initial production contract, which will expire in October. “This contract will substantially bolster Boeing’s performance-based support to the Indian Navy and should maintain or increase the operational capability of the eight-aircraft fleet,” said Boeing on Monday. We’ve all (hopefully) seen Captain America, whether in a movie, comic book, or any other of a dozen venues. Even those who have heard only a little know the basics: Captain America is the super-soldier, one man who takes on thousands… and wins. Alone or with the support of some more average people (Howling Commando soldiers or secret agents of SHIELD), the key is the Captain. Compare that to the more “realistic” versions of combat we see in Band of Brothers, Saving Private Ryan, or even Call of Duty. If one person takes on a thousand, the one dies. So can we learn anything from Captain America for national security in reality? Maybe so… in information operations (IO). Normal combat takes place in a physical realm, where normal (Gaussian) distributions and bell curves make sense. For millennia, we have learned the rules and principles of war or battle, if you prefer. We know that mass matters, and no single soldier is going to overwhelm even five adversaries, in any but the most bizarre circumstances. The rarity of those circumstances means that the effects of any single soldier are generally lost in a battle- the entire effort “averages out.” That is a key reason that having many soldiers is crucial in traditional combat. Informational combat is atypical. Normal distributions are not normal at all, and bell curves are an illusion that poor commanders use to console themselves, seeking the comfort of a simple model instead of the frightening truth. Information warfare is the world of Captain America. In information warfare, communications professionals hone and craft hundreds of stories, developing articles like basic training develops recruits. Editors mold these stories with the sharp criticisms we once heard from drill sergeants like R. Lee Ermey or Heinlein’s Sergeant Zim. They know they are useful. Stories can overwhelm mental defenses like a traditional mass combat can overwhelm physical defenses. Psychologists have shown that repetition creates the perception of truth, regardless of factual basis, so sending story after story against the minds of opponents can be very effective over time. But the human wave is not the key to modern combat, and the story wave is not the key to modern information conflict. Hacker conferences are famous for using quirky, hackablebadges. DefCon's 2015 badge was a working vinyl LP containing a spoken-word ciphertext copy of the Hacker Manifesto. But at the Chaos Communication Camp, held in Zehdenick, Germany last week, the organizers did something different: they gave out 4500 rad1o badges. These software-defined radios are sensitive enough to intercept satellite traffic from the Iridium communications network. During a Camp presentation entitled "Iridium Hacking: please don't sue us," hackers Sec and schneider demonstrated how to eavesdrop on Iridium pager traffic using the Camp badge. The Iridium satellite network consists of 66 active satellites in low Earth orbit. Developed by Motorola for the Iridium company, the network offers voice and data communications for satellite phones, pagers, and integrated transceivers around the world. (Iridium went bankrupt in 1999, but was later purchased from Motorola in 2001 by private investors, who have revived the company.) The largest user of the Iridium network is the Pentagon. "The problem," Sec explained, "isn't that Iridium has poor security. It's that it has no security." U.S. Army personnel have successfully used advanced electronic warfare technology to completely disable enemy armor during a simulated tank assault at the Army National Training Center, Defense Systems reports. Developed by the Army Rapid Capabilities Office (RCO), the combination of wireless communications-jamming and hacker exploits of vehicle systems forces enemy tanks to “stop, dismount, get out of their protection, [and] reduce their mobility,” as one Army observer described the ANTC training exercise at Fort Irwin, California. This is only the second major Army test of tactical electronic warfare in recent history. In April, the RCO outfitted nearly 20 soldiers from the 2nd Cavalry Regiment at U.S. Army Garrison Bavaria in Vilseck, Germany, with advanced electronic warfare equipment for field-testing, the first time an Army electronic warfare system had been deployed in a tactical environment. By year’s end, the Pentagon wants computers to be leading the hunt for Islamic State militants in Iraq and Syria, through turning countless hours of aerial surveillance video into actionable intelligence. It’s part of Project Maven, a fast-moving effort launched last month by Deputy Defense Secretary Bob Work to accelerate, improve, and put to wider use the military’s use of machine learning. Thousands of military and civilian intelligence analysts are “overwhelmed” by the amount of video being recorded over the battlefield. These analysts watch the video, looking for abnormal activities. Right now, about 95 percent of the video shot by drone aircraft is from the campaign against ISIS in Iraq and Syria. The Pentagon has raced to buy and deploy drones that carry high-resolution cameras over the past decade and a half of war in Afghanistan and Iraq. But on the back end, stateside analysts are overwhelmed. Pentagon leaders hope technology can ease the burden on the workforce while producing better results on the battlefield. DISA director Lt. Gen. Alan Lynn talks about the tech he’s eyeing, some of which is barely out of the theoretical realm. Tomorrow’s soldiers will wield encrypted devices that unlock to their voices, or even their particular way of walking, and communicate via ad-hoc, software-defined networks that use not radio waves but light according to Lt. Gen. Alan Lynn, who leads the Defense Information Systems Agency, the U.S. military’s IT provider. On Tuesday, Lynn talked about next-generation technologies that DISA is looking into, some of which are barely experimental today. Forget thumbprint unlock screens for phones and communications equipment. Tomorrow’s next-generation biometric identifiers are related to the data that soldiers create through their activity. That could include everything from the way that a soldier walks, to the way she holds her phone, to places that she’s been.